First, I would like to thank you so very much for the absolutely perfect summer we have had. I mean, compared to last year, when it rained the whole month of June, this year was fantastic. And I don't really want to sound ungrateful. Because I am not really. It's just that you managed to hold off the rain for most of August. Which was great. But we were busy in August. And I am sure everyone whose events we attended or catered really appreciated that you held off the rain. But now we'd like to have a little us time. In our camper. Yes, I laughed last week when we had a minor nor'easter while camping at the beach. Funny. Ha ha. You are such the kidder. However, I am starting to think that maybe you are mad at me. I mean, we haven't camped since June, so a nor'easter was a bit much. But now, this weekend coming is Labor Day. It's a big three day weekend. And you brewing up Earl in the south Atlantic and sending it our way is just a bit much, don't you think? 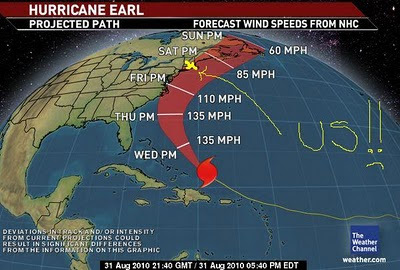 So, if possible, can you please send Earl to the East of the East Coast? I would forever be grateful as would a bunch of other campers I know. We are leaving tomorrow to go camping.